"What's this, Ralphy? Did you just really stalk that Krisly girl in 2011?" NO. OKAY, CONTEXT FOR THIS ONE! 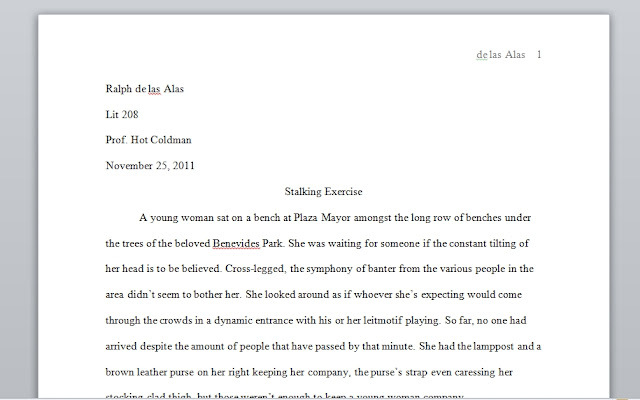 In 2011, for Literature 208 class, we were given an assignment of stalking someone and writing about them. Only rules were that we shouldn't have been seen and we shouldn't know the person. The subject didn't have to be anyone of the opposite gender. I remember the professor who gave this assignment - let's call them Hot Coldman - told us that he wrote about an old man in the park. I thought it was a huge waste of time but hey, what can I do? It was required. I think I had some classmates cheat and say they stalked each other but I can't confirm that since I was just eavesdropping. 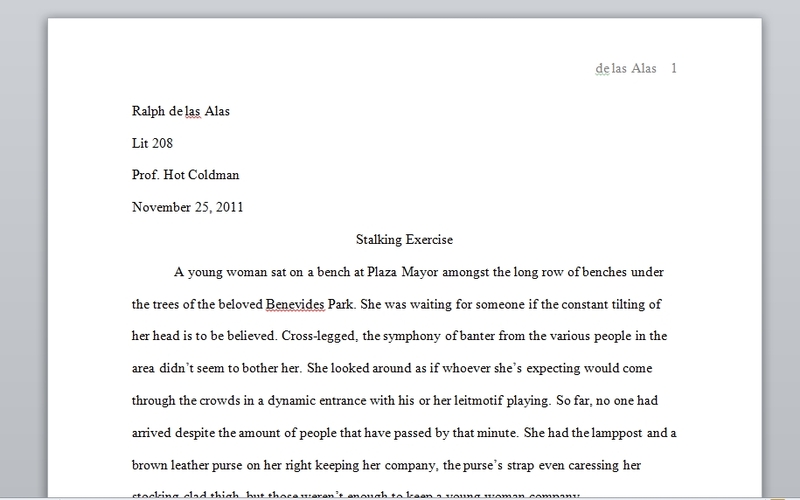 I didn't have time to do this assignment nor did I want to get arrested for stalking because I'm not good in stealth. I'm no Solid Snake. Mr Coldman: "Ralph, why's your stalking exercise late?" Me: "Kept you waiting huh?" A young woman sat on a bench at Plaza Mayor amongst the long row of benches under the trees of the beloved Benevides Park. She was waiting for someone if the constant tilting of her head is to be believed. Cross-legged, the symphony of banter from the various people in the area didn’t seem to bother her. She looked around as if whoever she’s expecting would come through the crowds in a dynamic entrance with his or her leitmotif playing. So far, no one had arrived despite the amount of people that have passed by that minute. She had the lamppost and a brown leather purse on her right keeping her company, the purse’s strap even caressing her stocking-clad thigh, but those weren’t enough to keep a young woman company. She was a lovely young woman in her late teens with a fair complexion. Her dark brown hair went past her shoulders and nearly touching her petite chest. Her lips were pink from the lipstick. The light makeup applied on her face just made her stand out from the slightly homely ones distant from where she was seated. Although for some reason, no one bothered to take a glance at her, even for just a second. She wore a navy blue vest with yellow green lining on the borders. The green coat of arms belonging to the faculty she was from was sewn on the left side of the vest. Beneath the vest was a white short-sleeved shirt finished off with a translucent yellow green scarf tied in a loop knot. Her skirt had the same shade as the vest, making it seem like one formal dress. The black stockings on her slender legs made the blue of her clothes seem brighter than it was. She was dangling one of her black high heeled shoes on her right foot – perhaps a sign of boredom but remotely impatience. She looked at her beige watch dangling on her left wrist and looked at her surroundings once more. The various students are distant from where she sat, making it seem like there was some sort of force field around this young woman. She uncrossed her legs and puts her shoe back on. She grabbed her purse and places it on her other side before unzipping it and reaching in for a gadget, similar to a cellphone in appearance. Her fingers glided through the screen, tinkering with it perhaps. After a few moments of finger movement, she reached into her purse once again and brought out a pair of white earphones. She placed them onto her ears and proceeded to press the play button on the MP3 player. The music gave her the impulse to lightly nod her head in tune with the beat. She took a moment to take an extended glance at two pharmacy students passing by her within a few meters. The look seemed like it was something she wanted, as a bit of jealousy or desire was hinted. Or perhaps the fact that she was alone in that moment and wanted what those two had – the company of each other. She looked at her right, still anticipating whoever she was waiting for. Despite the number of people slowly dwindling, she still had not seen anyone familiar. She crossed her legs once more to be comfortable as she might have to wait a little more. She reached into her purse once more and brings out a white and baby blue handkerchief. She wiped her forehead as the layers of clothing she had have brought her more heat. The handkerchief’s deed is done as it was placed back in her purse. She leaned her arm onto the metallic lamppost beside her as she continued listening to her MP3 player, alone and in the middle of a place where people were barely noticing her. Perhaps the passers by thought was melancholic, judging from her current state of waiting alone in a park filled with different people who had each other’s company. She slouched out of boredom, even uncrossing her legs once more. After several moments have gone, the young woman saw several other young women several feet away. The group was dressed similarly dressed as the young woman was, perhaps they must be classmates or studying in the same faculty at least. These other young women were homelier than the young woman seated on the bench as the amount of makeup they wore would parallel The Joker’s. The young woman had removed the earphones and wrapped it around the MP3 player loosely. She put away the player and the earphones into her purse. She adjusted her vest and dusted off her skirt and stocking-clad legs to look neat than she already was. She waved with glee as she advanced to her friends several feet away, smiling, realizing that her wait was over. The four young women start to talk in the middle of the plaza as if no one else had mattered around them. They were ecstatic as if they hadn’t seen each other for quite some time. Their laughing was nearly as loud as a shout but still didn’t echo as there was still more noise in the area that surpassed theirs. The group of young women sat beside each other on the bench the first young woman as sitting on earlier, their thin physiques allowing them to fit. But the first young woman stood up, realizing that they were like sardines in a can if they had sat beside each other. She gave a high five to one of her friends moments after a hilarious joke was told. They were still laughing audibly for anyone close by as if their jokes were told by an actual comedienne. After a few minutes of talking, the young woman got hold of her purse and unzipped it. She reached in and got her MP3 player with the earphones still wrapped around it loosely. She took the earphones off the gadget and handed the pair to her friend. After the exchange, the young woman and her group of friends decide it was time to leave as they stood up one by one. As if they were one cohesive unit, the group cross the street and to the accountancy building. With her friends, the young woman passed by the lineup of eateries as she continued exchanged jokes and gossip with them as if there was no tomorrow. However, their talking seemed to be more low-key and mellow than it was before, like the volume knob was rotated to keep their noise down. The collective clicking of high leather heels on the concrete sidewalk was audible for anyone close by. The voices of the students with the blue motif were starting to mix in with the other groups of students, creating a distorted symphony of banter that would disorient the ears that try to listen in on every word. The young woman and her friends met up with several other similarly dressed women headed the same direction. She and her friends made their way to the entrance of the gray building named Albertus Magnus, blending in with the small crowd of young women in navy blue vests and skirts with black stockings headed for the entrance as well. They were a small crowd of blue, white and black. The young woman – her face, her physique, her voice, her beauty, her entity – finally blended in with the others.